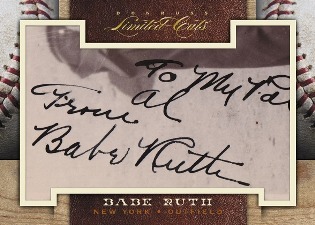 The hobby has seen no shortage of cut signature products. Panini is the latest to enter the arena with 2011 Donruss Limited Cuts, a product that includes athletes, celebrities, pop culture icons and Presidents. Every card in the release is numbered to 49 copies or less. The checklist has more than 140 deceased Hall of Fame baseball players, including Babe Ruth, Walter Johnson and Cy Young. 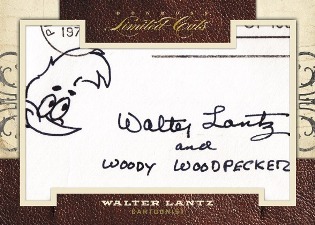 Dual and quad signature cards also appear. Early samples show an elegant design that mirrors the high-end subject matter. 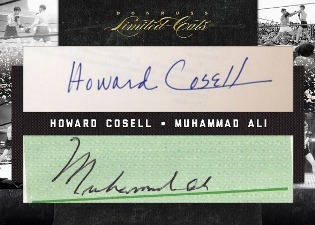 Single, dual and quad autograph cards span across all major sports, entertainment, politics and pop culture. More than 140 deceased Hall of Fame baseball players are on the checklist, including Babe Ruth, Ty Cobb, Lou Gehrig, Jackie Robinson, Honus Wager, Walter Johnson and Cy Young. All cards in the released are numbered to 49 or less. More than 200 are numbered to 15 or less. A one-of-one card features Eddie Cicotte, Chick Gandel, Charles Comiskey and Kenesaw Mountain Landis from the 1919 Black Sox scandal. 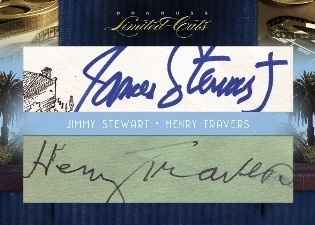 Multi-signature cards include members of the 1927 and 1961 Yankees, 1912 Giants, 1929 Athletics and 1955 Dodgers.